New Delhi, Nov 19 (IANS) Ahead of the 550th birth anniversary of the first Sikh Guru and founder of the Sikh religion Guru Nanak Dev next year, the Centre has decided to undertake a series of commemorative activities across India and abroad. 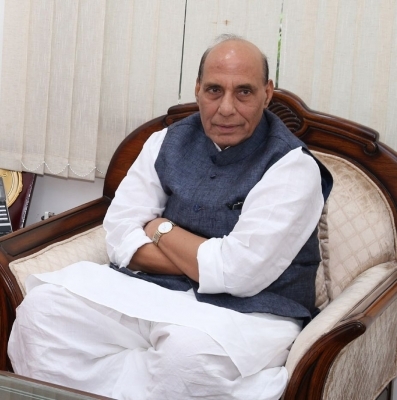 The decision was taken at the third National Implementation Committee (NIC) meeting chaired by Home Minister Rajnath Singh on November 8 in the presence of Minister of State for Culture Mahesh Sharma, Governor of Punjab V.P. Singh Badnore, Minister of State for Electronics and Information Technology S.S. Ahluwalia, and Punjab's Minister of Tourism Navjot Singh Sidhu, said a Home Ministry statement on Monday. The NIC, constituted by Prime Minister Narendra Modi to commemorate Guru Nanak's 550th birth anniversary next year, earlier had two other meetings under the chairmanship of Rajnath Singh with Finance Minister Arun Jaitley and Minister of State for Culture as members. "It was decided that the event will be commemorated through a series of activities commencing in November 2018 (November 23, the 549th birth anniversary of Guru Nanak) throughout the country and across the globe," said the statement. A commemorative coin and postage stamps will be released by the Department of Economic Affairs, Ministry of Finance, and Department of Posts, it said. Sultanpur Lodhi, where Guru Nanak spent much of his life, will be developed as a heritage city, also incorporating Pind Babe Nanak Da, by the Ministry of Housing and Urban Affairs in collaboration with the Punjab government. The Union Ministry of Railways will upgrade Sultanpur Lodhi railway station with modern amenities. A national institute of Inter Faith Studies will be set up by the Ministry of Human Resource Development in Punjab for which the state government will provide land free of cost. The Ministry of Electronics and IT will install a high-powered telescope in India for the devotees to view Kartarpur Sahib in Pakistan. A Chair on Guru Nanak Dev will be set up by the Ministry of Human Resource Development in one University each in the UK and Canada. An international seminar on the life and teachings of Guru Nanak Dev will be organised in New Delhi by the Union Ministry of Culture. States and Union Territories will also be requested to celebrate the 550th birth anniversary of Guru Nanak Dev in a befitting manner. The Ministry of Culture will work with the state governments for this. The Indian Missions abroad shall organise a series of activities as part of the celebrations. The Ministry of Railways will run a train passing through places associated with Guru Nanak Dev. "Religious activities like kirtan, Katha, prabhat pheri and langar will be organised throughout the year both at national and international level," said the statement, adding that the Shiromani Gurdwara Parbandhak Committee (SGPC) -- an organization in India responsible for the management of gurdwaras, Sikh places of worship in three states of Punjab, Haryana, and Himachal Pradesh and union territory of Chandigarh -- will draw a calendar of activities and execute it. Educational activities such as seminars, workshops and lectures shall be organised throughout the country by the Ministry of Human Resource Development in association with SGPC. Doordarshan will arrange live telecast of programmes on Guru Nanak and the Gurbani. The Rajya Sabha and Lok Sabha secretariats will be requested to consider telecasting the same on Rajya Sabha and Lok Sabha TV. Publication of Gurbani in different Indian languages will be done by the National Book Trust. The United Nations Educational, Scientific and Cultural Organization (Unesco) will be requested to translate and publish an anthology of Guru Nanak's writings in world languages.